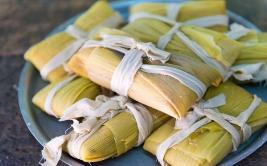 Guanimes de Plátano (Green Plantain Tamales) - Tienditadepuertorico.com - Buy Puertorican Food Here!! Soak plantains in salted water for 30 minutes. Remove from water, rinse, and dry plantains. Grate plantains into a paste. Blend in broth or coconut milk. Form each guanime in sausage shape, about 5 inches long and no more than one inch thick. Place on a piece of plantain leaf, folding the leaf at the edges, and wrap with thread.